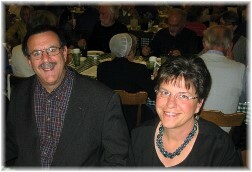 Message summary: Hebrews 1:3 says that Christ is “sustaining all things by His powerful Word”. Today I am confident that He will continue to uphold and keep the earth as long as He ordains its existence. He will also continue to sustain you and me. After all, “all things” covers it all! 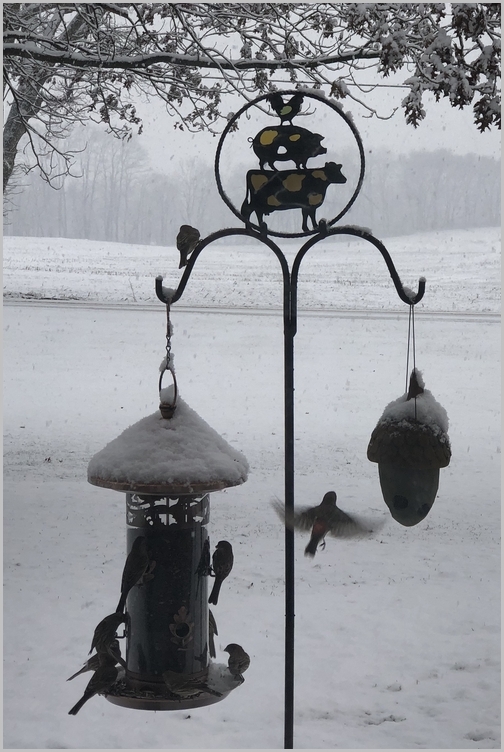 “While the earth endures, seedtime and harvest, cold and heat, summer and winter, day and night, will never cease” (Genesis 8:22). “Sustaining all things by His powerful Word” (Hebrews 1:3). 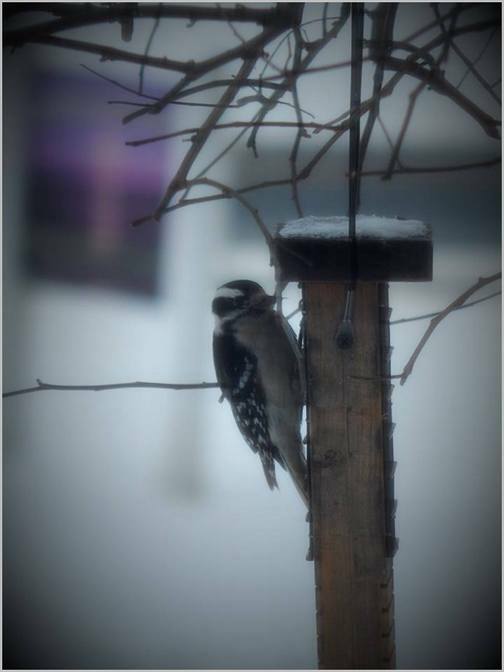 We are experiencing the effects of a polar vortex, a term I don’t ever recall hearing until about five years ago. Sometimes we also hear the term arctic blast. That means it’s very cold outside! This morning my online weather page showed -4° when I began this message. However my cousin in Wisconsin told us they had wind chills of -40° to -60° so I suppose you could say it’s relatively warm where we live! 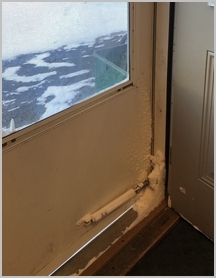 This morning we have drifts in our driveway from the blowing snow and the photo to the left shows how the snow managed to blow through the gap around our poorly self-installed storm door. Mollie insisted on going out, because she insists on trampling through the snow, but within a couple of minutes she lifted her right paw and then her left paw, rotating them back and forth as she was uncomfortably struck by the intense cold. Most schools in our area are closed but it’s a bright sunny day in spite of the frigid temps. A polar vortex is a whirling mass of cold air circulating in the mid to upper-levels of the atmosphere, present every winter. It usually stays closer to the poles but sometimes breaks apart, sending chunks of Arctic air southward into the U.S. during winter (from CBS news). The wind is a lot less today but yesterday it was blowing so hard my recyclables blew all over the yard and beyond. It was just too cold to try to retrieve them. 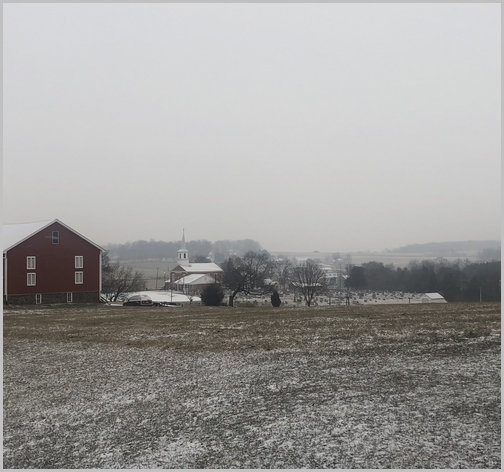 We also lost power again yesterday due to downed power lines, but it was restored quickly before our electric feed coal stove went out, unlike the day before! Listening to the howling winds and feeling the cool air in our otherwise warm house makes us long for sunny summer weather. But right now the U.S. and many of our friends overseas are in the midst of the winter extreme “fallout”. We experience cold temps each year, though sometimes more than others. 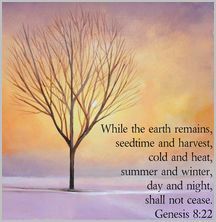 God made a standing promise to Noah after the flood which is known as the Noahic Covenant: “As long as the earth endures, seedtime and harvest, cold and heat, summer and winter, day and night will never cease” (Genesis 8:22). Each of the events and seasons described in the covenant are easily observable. Here in our rural area we regularly witness “seedtime and harvest” across the road from our house as the farmers plant and harvest. And of course no one would contest that we still have “summer and winter, day and night”. We also all experience “cold and heat” in varying extremes depending on where we live. We have friends in San Diego where “cold” might be when it gets in the 40°s. Right now for me that would be practically short sleeve weather! As long as the earth endures, these “will never cease”. The earth is still enduring and each of these easily observable characteristics have not ceased! God continues to faithfully keep these promises. Using a powerful phrase from the Book of Hebrews He is “sustaining all things by His powerful Word”. Although it is forecast to be very cold all day we expect this blast of cold from the polar vortex to soon cease and temperatures to return to more normal tomorrow with a high of 22° (which is still pretty cold). But an aspect of God’s sustaining care is seen when we consider how much colder or hotter it could get! I have read that if the earth was just a small fraction closer or farther from the sun we would have extremes that would make life as we know it intolerable. The same is true for the earth’s design in its rotation on its axis and its revolution around the sun. Yet God has designed and sustains the earth in an extremely predictable pattern. There are design limits in God’s continuing care over the earth as He faithfully sustains it. We may grumble about the cold or the hot, but I’ve never met anyone that is terribly worried that the earth will move just a fraction closer to or farther from the sun causing us to suddenly boil or plunge to 100 degrees below zero! Hebrews 1:3 says that Christ is “sustaining all things by His powerful Word”. Today I am confident that He will continue to sustain and keep the earth as long as He ordains its existence. He will also continue to sustain you and me. After all, “all things” covers it all! Daily prayer: Father, You sustain all things by Your powerful Word and through Your sovereign control. The natural order of Your creation is the means by which we live day after day, year after year. Just as there are variables in the seasons there are variables in our lives as we walk this pilgrimage on earth. There are bright, clear days in which we feel on top of the world, and there are dark, cold days when we feel our world will soon come to a halt. But we are encouraged as we look to Your powerful Word that reminds us You are our loving God who sustains us in the variables of our daily circumstances. Because of that we can trust You even in the extremes of life. We thank You in the powerful name of Jesus who is Your exact representation on earth. Amen. 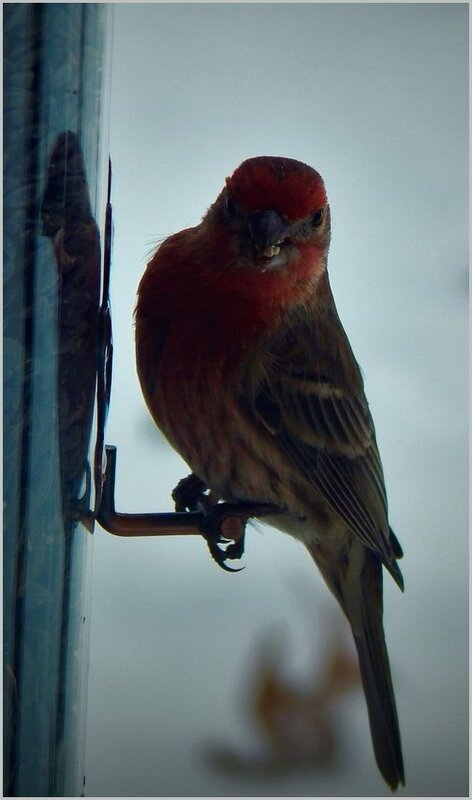 Our birdfeeders were very busy during the snowfall, mostly finches. 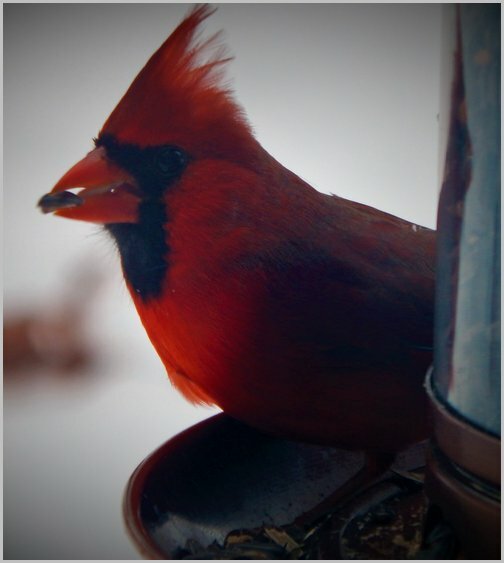 Mr. cardinal is enjoying a black oil sunflower seed. 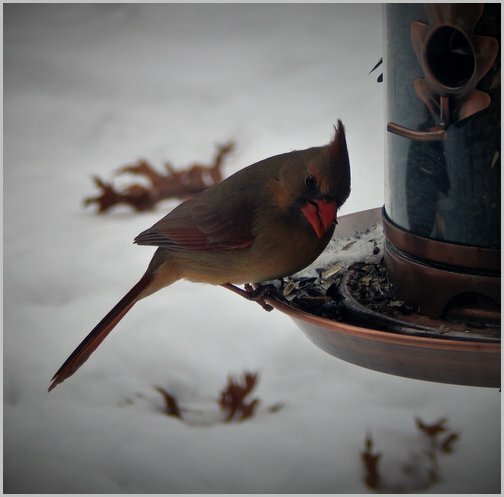 Of course Mrs. cardinal is nearby. It must have been cold in this buggie which passed by our house about 9:00AM this morning when the temperature was about 3°!